Pakistan joined the MEFIN Network in January 2016 together with five other Asian countries. It is the newest member of the Network which serves a regional platform for peer-to-peer exchange of knowledge and experiences in inclusive insurance. 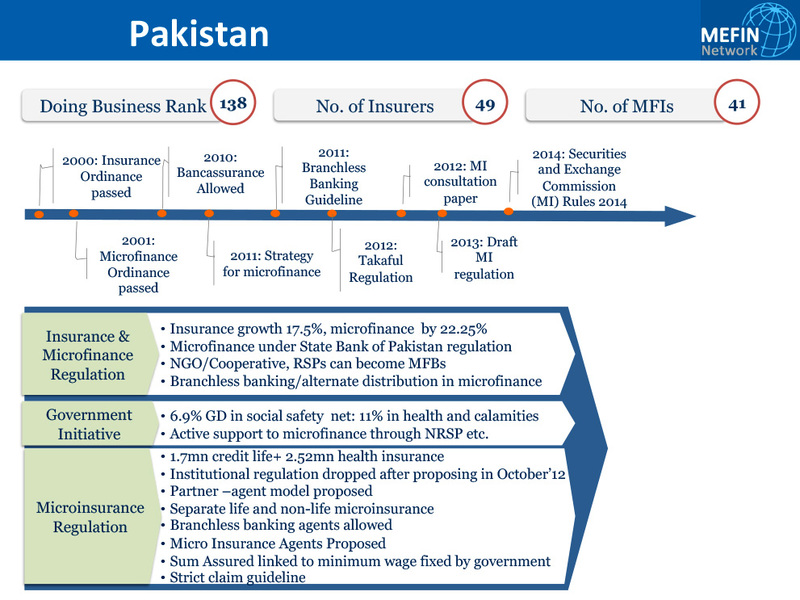 At the time of independence in 1947, Pakistan had five domestic and 77 foreign insurance companies. These were regulated under the Insurance Act of 1938. In 1948, the government established the Department of Insurance within the domain of the Ministry of Commerce to supervise the insurance industry and safeguard the interests of the insured. The Act was amended in 1958 in view of the requirements of the domestic market and to have effective control over the insurance premium rates. Various amendments followed. In 1970s, the government nationalized all insurance companies and created a large state-run conglomerate, today called the State Life Insurance Corporation of Pakistan. The Department of Insurance further created the controller of insurance for the same purpose that was abolished in 2000 when the Security and Exchange Commission of Pakistan (SECP) was made responsible for supervising the insurance business in the country. Pakistan is the 36th largest country in the world in terms of area. It was created in 1947 as an independent nation for Muslims. In 1956, it adopted a new constitution becoming an Islamic republic. Pakistan has a semi-industrialized economy with a well-integrated agriculture sector. It is characterized among the emerging and growth-leading economies of the world. Pakistan has made substantial progress in reducing poverty giving it the second lowest headcount poverty rate in South Asia. It is ranked 16th on the 2012 Happy Planet Index while its stock exchange has been among the highest performing in Asia. Pakistan 's Gini ratio, the coefficient that measures inequality among income distribution, lies at 35.6 and the HDI at 0.537.